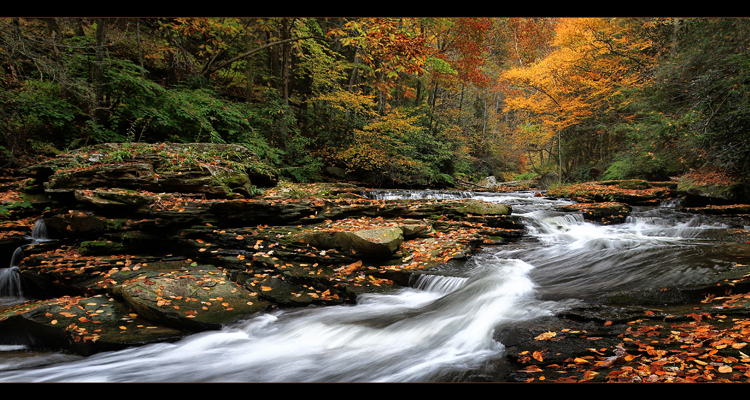 In the secluded woods of West Virginia, Jaki Good Miller took her Sunset Print Award-winning photograph, Autumn Cascades. This is only her second year entering competitions, but her second win of a Sunset Print Award; her first was last year with her image Morning on Mormon Row. “I think it was skill, but also some luck,” she says with a laugh. Her vibrant image, Autumn Cascades, captures the brilliant colors and textures of this West Virginian landscape, instantly captivating the viewer. She originally began taking photos in 2003, after she was diagnosed with cancer. “I had to take a year off,” she says, “so I spent that year in the woods, photographing everything from birds to flowers… and it was such a peaceful thing.” From there, she began posting photos on Flickr and created a local following and clientele. The competitions aren’t about blue ribbons or trophies to her. “I am competing against me, not others,” says Miller. To her, the challenge is getting outside your own head and creating an image that has a story; something that people can connect to. Raven Chapman grew up in Sarasota, Fla., and is currently a senior at the University of South Florida, where she is majoring in Professional and Technical Communication. She is planning on pursuing a Masters in Management in the coming year. At S-One, she assists the Marketing Department with content development, research, and public relations.